Junior entry. Missed almost all of 2016 with a knee injury. After watching him in 2015, I thought this kid would be the next Sean Taylor and that is a comparison I have ever really used before. Such a rare blend of tools and showed the knack to make plays all over the field The versatility he offers is unmatched and if the right defensive coordinator gets his hands on him, watch out. There are some movement issues in coverage however. I’m not sure I would fully trust him in deep coverage against receivers but that can be hidden a bit. He is an elite prospect. Junior entry. Has been a three year contributor/starter for the best defense in college football. Fitzpatrick is known as “Nick Saban’s Son” on campus. His intangibles are top notch and they are paired with talent that is NFL ready right now. Some teams may view him as an outside corner while others see a nickel corner and safety. He could play anywhere in the secondary. Sometimes those players can be dangerous, however. His game still looks raw at times because there may not have been enough attention on specific skill sets. I think his best role is a safety that can spend most of his time near the line of scrimmage but will have no issues in coverage. Get this guy on the field and he will improve the defense right away. Four year starter that has had some issues staying healthy over his career. At his size, durability is a concern at the next level and it did impact his grade a bit. Watts ended his career making a few All American teams. For some time, Watts was my favorite pure cover safety in the class. He has the instincts, easy moving lower half, and ball skills to be a major factor. The size is an issue, as is the inconsistent tackling style, but I still think he is a difference maker. His intangibles are top notch and the weaknesses in his game will be worked on. He is worth the gamble because this kid is going to make plays. Junior entry. 2 year starter that has led the Alabama defense over the past 2 years combined. The enforcer of the secondary, perhaps even the defense as a whole. Big time power and presence, he is the kind of guy that will strike fear in to NFL pass catchers over the middle. As a cover man himself, Harrison struggles to stick with his man. He allows separation because he lacks some fluidity in his hips. However when it comes to reaction speed in combination with his size, he can still impact the game in all phases. If he is used correctly, he is an impact guy right away. Fourth year senior that has started games at CB and S. The instincts are what jump off the screen here and it is arguably the most important trait I look for in a free safety. Webb has consistently shown the knack to anticipate throws and routes with the best of them. If I had to rank these safeties based on feel, Webb would be at the top. He lacks some of the desired tools, mainly size, but in a system where a true centerfielder is needed, he is a prized asset. 3+ year starter. Led Penn State in solo tackles each of the past 2 years, a rare feat for a defensive back from that program. Allen was the leader of that defense with his ability to make big plays in big spots and his overall awareness of game situations. He was an extra coach on the field. He is a rangy tackler that can be relied on in space, but he needs to be somewhat protected in coverage. He has good-enough speed but the quick reactions and natural hip turn isn’t there. Can be a solid starter in the right situation. Junior entry. Brother of current free agent safety Eric Reid. Ended his career with a 2nd Team All American season. Some view this kid as a 1st rounder but I just haven’t seen him play consistently enough to put him anywhere near there. He has tools and he plays fast, but there is a lot of guess work with him. I value the natural flow and instincts at safety as much as anything and he doesn’t grade out well there. If you can hide that in your scheme, he can be solid. Four year starter. All time leading tackler in UVA history. Blanding has been a highly touted, award winning safety for a few years now. He lacks the desired talent and ceiling but I don’t ever overlook safeties that produce a lot and play the game smart. He was head and shoulders above his opponents mentally. I think there is a spot for him somewhere, just wouldn’t count on him being a star. After being suspended for the first 4 games of 2016, Brown got in to the regular rotation wearing several hats. Some view him as a slot corner but I think he is better suited for safety. He doesn’t mirror quickness that well, but when he has some space to work with his can explode and burst in to the spot he needs to be. Brown, a All American track star, has tools that weren’t always put on display at Alabama. I actually think he would be higher-touted had he not been surrounded by so much talent at Alabama. Junior entry. After an All American season in 2015 as a freshman, the national spotlight got put on Elliot. Over the next two years, he never seemed to come close to those expectations. He ended up seeing his production and playing time go down a tad and there have been whispers of him not being a great team guy. Elliot has the tools and past production to give him the high ceiling label, but it’s been too long since I have seen any consistent high level play. Mid rounder that will have more potential than most drafted in that area. Redshirt sophomore entry that surprised a lot of people with his declaration. He did have two strong years production wise with his ability to read the action and get involved consistently. He has the natural flow towards the action and foot speed to really get involved. But I question his frame and lack of power presence, something most will overlook when scouting safeties. I think he can be a solid player in time, but not early on. Fifth year senior. One of the more consistent performers on the Northwestern defense for 4 straight seasons. Has been an All Big 10 performer 2 straight years. There are some out there that really like this kind, calling him a 2nd rounder. I can see why if you are looking for an extra run defender that can play the hybrid S/LB type role. He is a good tackler, shows range, and reacts well. But in coverage he never took the step up over the past couple years. He just looks a little lost and stiff out there. He has the athletic ability, but it doesn’t carry over enough. He will be an excellent special teamer and run defender, but he will be limited in coverage. Fifth year senior. Began his career at Georgia and they were really excited about him. Made a few dumb mistakes and got kicked out of the program. He spent 3 years as a starting safety for the Tigers. He has shown major improvement with his character, he turned in to the leader of the Auburn defense. He is an excellent run defender, maybe one of the best among this group. He is a liability in coverage against WRs though. Poor man’s Fitzpatrick but one that can make an impact on special teams and run defense. Junior entry. I was surprised he came out because another year in college could have thrown him in to Budda Baker territory if he showed the ability to make more plays in coverage. Smith is very small to the point where some teams won’t even look at him because of it. But rarely did I watch him and think it was a major issue. He is a tough, hard nosed defender that gets involved against the run often. Can he hold up? That’s the question. Smith didn’t make enough plays on the ball in coverage and some will say it is because of his size. He can be a package player early on but may have a very low ceiling. I still think there is some hidden nickel CB in him that could be a very good value. Fifth year senior. Has led the program in interceptions each of the past 2 years and was their leading tackler in 2018. One of the top prospects coming out of the Sun Belt conference. Walker has my attention and I think my grade could have been a little higher on him had he moved better in deep coverage. As a downhill, reaction based defender, he has the goods. Really high ceiling here. When I look at the Giants defense, I note that I have been bothered by the lack of presence next to Landon Collins since he was drafted. While he has gotten off to a nice start to his career and I do view him as a long term leader on this defense, he would be much more productive with a playmaker next to him. One that can roam deep coverage and actually make plays on the ball. While I don’t consider his a major need, or even a secondary need for that matter, I wouldn’t pass on a big value if one presented itself. I am looking at that day 3 area if someone like Damon Webb was there. There are high ceiling guys available late, as well. 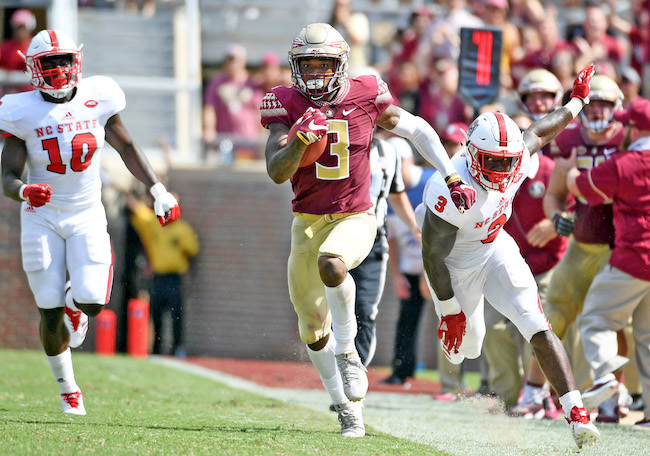 As highly as I view Derwin James, he isn’t someone I would consider early because he is too similar to what Collins brings to the table.